Kodate, A. (2012). The JASAL Forum 2011: Growing trends in self-access learning. Studies in Self-Access Learning Journal, 3(1), 122-132. 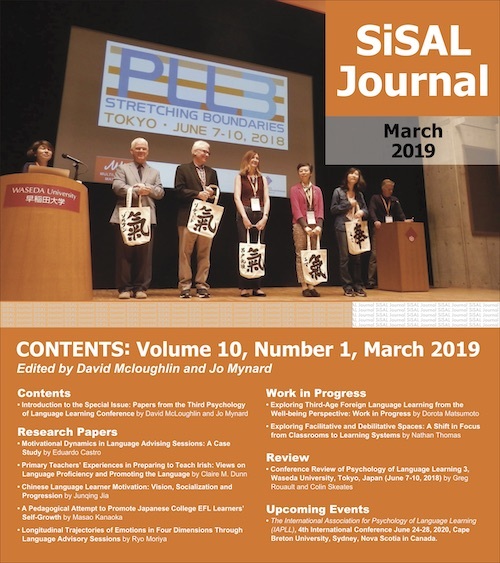 JASAL (the Japanese Association of Self Access Learning) was set up in 2005 by Garold Murray and Lucy Cooker to provide a support network for educators and administrators involved in the growing field of self-access learning in Japan. It hosts a website with information related to self-access learning in Japan, a discussion listserve and holds an annual forum at the JALT national conference. To find out more or to join JASAL (it’s free!) please visit the JASAL website, http://jasalorg.wordpress.com/join-us/. The following is a report by member Azusa Kodate of the 2011 JASAL Forum held at JALT2011 in Tokyo on November 19th, 2011. The annual JASAL forum was held in Tokyo in 2011 in keeping with the theme of the JALT 2011 conference, ‘Teaching, Learning, and Growing’. Drawing on the theme of this year’s JASAL forum, ‘Growing Trends in Self-Access Learning’, several different trends emerged from the two paper and five poster presentations that illustrate the ongoing growth of the field. Contents of the presentations varied widely from an administrative operation of a self-access centre (hereafter SAC) to research findings about SAC users. Having approximately 45 people including presenters at the forum, active discussions in which they shared ideas and professional practices were generated. One of the common points which emerged in the forum was that the form of learning that SACs provide is becoming more accepted and valued by educational institutions, and this has led to an increase in the number of SACs nationwide in Japan. Against this background, three themes were evident in the presentations given at this year’s forum: focusing on the physical learning environment, providing easier access to learners, and supporting learning processes. Physical environment, such as furniture layout and materials displays, can have a great impact on learner motivation in independent learning settings (Gardner & Miller, 1999). As educators who support learners in such environments, we carefully need to observe interactions taking place between learners and their environment to provide comfortable and motivating learning opportunities. An important part of this physical learning environment is the service provided by SAC staff. Satomi Shibata from Tokoha Gakuen University talked about the importance of creating spaces that can foster learners’ independent learning. Having experience of establishing a SAC at both Nagoya Gakuin University and Tokoha Gakuen University, Shibata noticed some patterns in how learners use the centres and in their behaviour in the centres. She conducted an ethnographic study to investigate the correlation between environmental factors and learners’ behavioural patterns. The data collected from her field notes and interviews highlighted some tendencies in learners’ decision-making processes about choosing where to sit and study in the SAC at Tokoha Gakuen University. According to the data, learners sat relatively close to the desk where SAC staff were based when they felt they may need support from teachers or wished to focus on their learning. On the other hand, they sat away from the staff desk when they did not feel like pushing themselves very hard in their studies. Shibata’s research findings also showed that learners selected chairs and desks based on their learning objectives on any given day, even though the majority of them did not consciously do so. They tended to choose round-shaped desks when they wanted to relax and square-shaped desks when they wanted to focus on studying. Based on her findings, Shibata emphasized that, as educators, we need to pay close attention to our learners’ behavioural patterns to make our centres more usable and accessible, as well as to enable learners to make necessary decisions in their learning processes. Shibata also suggested changing the layout of the SAC on a regular basis to provide various learning environments to meet a wider range of learners’ learning needs and styles. SAC Director Caleb Foale, and Momoko Iida, an administrative assistant from Hiroshima Bunkyo Women’s University, presented their perspectives on how we can support learners’ independent learning by providing high levels of service to learners. Foale and Iida pointed out that whereas it is important for the SAC to be able to provide quality educational service, it is also important to provide satisfactory administrative service to promote the SAC among language learners. Fourteen student staff members work part-time at their SAC and they are an essential asset to the centre because they act as role models as English language learners. Their presence also helps student users to lower their psychological barriers to entering and using the SAC, and they help the centre’s continuous improvement by contributing ideas from a user’s perspective. However, the centre also faces the challenge of raising the quality of customer service and other work carried out by the student staff to a satisfactory level. Foale and Iida explained how they use the PDCA (Plan, Do, Check, Act) cycle, also known as the Deming Wheel (Moen & Norman, 2006) in their SAC student staff training process as part of service quality control. Foale and Iida gave a few concrete examples of the application of the cycle in their staff training, and explained how their student staff benefited from thinking about how they could overcome problems, executing plans to actually improve their work and generating their own solutions to work problems. By utilizing the cycle in their training system, Foale and Iida suggested that the overall quality of the service provided by the student staff had improved and they had started behaving more independently to look for ways to improve the learning environment in the SAC and make it a better place for learning. They described their student staff as great role models, not merely as language learners, but also as independent learners. In summary, in those two presentations, the importance of proactiveness in constant improvement of learning environment in SACs was emphasised. Also, these presentations illustrated such approaches taken from various stakeholders’ perspectives. Simply providing a positive environment is often not sufficient to support learners in an independent learning setting. It is also necessary to provide means of easy access for learners. This point was also shared and discussed at last year’s forum under the theme of how educators can ease the psychological barriers that learners have in order to increase the numbers of student users (Foale, 2011). At this year’s forum, Clair Taylor, Keiko Omura, and Gerald Talandis Jr. from Toyo Gakuen University, Scott Crowe from Sojo University, Caleb Foale from Hiroshima Bunkyo Women’s University, and Daniel Sasaki, Kelly Kimura, and Yukiko Ishikawa from Soka University presented on how they improved the accessibility of their SACs. Clair Taylor, Keiko Omura, and Gerald Talandis Jr. of Toyo Gakuen University gave a presentation on the action research project they had carried out to investigate how to promote independent learning in the freshman English course at their university. Specifically, they looked at whether a stamp card system that they initiated helped learners became familiar with the facilities, materials, and systems that the university provides, and whether this prompted students to actually start using them. In this system, students were eligible to receive a stamp every time they used a conversation lounge for communication practice, participated in events held in the lounge, had a learning advisory session with a teacher, borrowed learning materials, or accessed in-house online learning resources. After piloting the system with 26 students from one class, it was implemented (with the co-operation of classroom teachers) on a much larger scale with over 600 students involved. The data collected comprised of the stamp cards used by students, online learning records, teachers’ reflective comments, and a survey of students. At the onset of the project, the system was set up in two different ways: mandatory and voluntary. Results indicated that the mandatory system encouraged students’ independent learning activities much more than the voluntary system, according to the number of students who completed the activities on the card. They also found that the rate of activity completion increased when classroom teachers encouraged or reminded students to use the card system. Taylor, Omura, and Talandis Jr. also noted that when individual classroom teachers started making modifications and improvements to the card system later in the research cycle (e.g., by colouring the cards, giving students prizes on completion of the card, and bringing students to the facilities), there was a positive influence on students’ use of the facilities. Moreover, they reported that the number of students who completed all the activities on the card increased from 4% (2010) to 56% (2011) after the stamp card system was made a credit-bearing component of the freshman English programme. Accordingly, they concluded that having students’ participation mandatory, giving hands-on induction and collaborating with classroom teachers were keys to promoting independent learning opportunities. At the SACs at Sojo University and Hiroshima Bunkyo Women’s University, attempts to integrate activities into the curriculum have also been made to encourage students to learn independently and to make use of the SACs. SAC Directors Scott Crowe and Caleb Foale spelled out the challenges they have been facing in trying to increase the number of student users given that their students are generally not familiar with independent learning, and the fact that neither university has a strong tradition of language learning. They emphasised that it is crucial for a SAC to be flexible and have the capacity to adapt to a target learner group. A series of activities were developed in each institution as a bridge between independent learning, which happens outside class, and learning which happens within class. These activities are voluntary at Sojo University, and compulsory at Hiroshima Bunkyo Women’s University. Through these activities, learners are introduced to tasks designed in such a way as to equip them with skills to choose appropriate learning resources, analyse their learning needs, build their awareness of their language levels and tendencies in learning, as well as to enable them to take greater responsibility in their learning. This is done in part by providing step-by-step instructions for language activities and graded reflective activities. Crowe and Foale explained that one of the features of these activities is to provide an opportunity for learners to enjoy using English so that they can overcome their negative feelings attached to English language learning at an early stage of their university studies. Another feature of the activities is an emphasis on developing skills for reflection and evaluation that enable learners to monitor and look back on their learning processes critically. This is largely done through reflective questions at the end of each activity. Foale referred to the value of using L1 for such reflective activities to let learners process their thoughts at a much deeper level. Incorporating activities that learners can enjoy and linking contents with the curriculum to support their learning in the SACs have resulted in an increase in the number of students using the centres at both institutions. Crowe and Foale concluded their presentation by discussing the degree to which independent learning should be completely voluntary. They emphasised their firm belief that it is one of the advisors’ responsibilities to try to reach out to learners, with the necessary appropriate guidance, to enable them to make choices about whether they want or need to learn independently. Furthermore, they have suggested this step-by-step process of learner reflection as a rationale for the provision of progressive learning activities in their centres. Daniel Sasaki, Kelly Kimura, and Yukiko Ishikawa from Soka University also addressed the difficulty of encouraging student use of SACs. At Soka University, an English Consultation Room, AV Library, Chit Chat Club, CALL, and World Language Centre Lounge are all made available for students in different locations on campus. Sasaki, Kimura, and Ishikawa raised four possible barriers that prevent students from using these facilities: a psychological barrier to entering the centres; information provided by the centres not getting through to students and classroom teachers; a lack of understanding about the centres by both students and teachers; and consequently, teachers not being able or willing to recommend and send their students to the centres. Based on these assumptions, their goals were to improve stakeholders’ interests and motivation to use the centres, improve the quality and quantity of information they provided, understand users’ needs and stakeholders’ demands, and provide users with more opportunities to be exposed to English language as well as independent learning environments. In order to address these issues, a scavenger game was developed as an orientation activity and was implemented as homework in English classes with the co-operation of classroom teachers. In this activity, students were asked to answer questions by physically visiting and looking around the centres. The underlying purpose here was to remove students’ psychological barriers to the centres and to help them understand the benefits they could derive from using the facilities and services in the early stages of their campus lives. Classroom teachers were also involved in the process of running the activities so they could develop their own understanding of the centres. As a result of these actions, they managed to help teachers to see the benefits of recommending the centres to their students. Sasaki, Kimura, and Ishikawa reported that by adopting this kind of promotional activity for the centres, they received positive feedback from a wide range of stakeholders, including students, teachers, centre managers, and librarians. They also reported that the number of centre users has been increasing since these changes were made. In summation, there are differences in the systems each SAC developed to provide learners with easier access. One of the common features of such attempts was collaboration with classroom teachers and the curriculum. Developing ways to contribute to the curriculum, and the establishment of a mutually beneficial relationship between SACs and stakeholders would be one of the keys for the success of SACs. While the presenters above make SAC more appealing and accessible in order to enable learners to conduct learning as independent learners, it is also necessary to support their actual learning processes. As Gardner and Miller (2005) suggested, ‘the provision of self-study language-learning materials (grammar, listening, etc.) which independent learners can use to satisfy their own needs and wants’, (p 19) and ‘the preparation of learners for greater independence in their learning by encouraging the development of individual strategies, reflection on learning and taking responsibility’ (p. 19) are one of our central roles as educators in this field. In the forum, Kato and Sugawara, and Kodate addressed these points by talking about tools that can be used to support and scaffold learners’ acquisition of skills useful for conducting successful independent learning. The English Language Learning Planner (Kato & Sugawara, forthcoming 2012) Supporting learners’ independent learning as learning advisors at Kanda Institute of Foreign Languages, Satoko Kato and Hisako Sugawara emphasised that simply focusing on the linguistic aspects of learning is not enough to promote independence in language learning. Rather, it is essential to equip learners with skills to manage and control their own learning processes (Benson, 2011). Based on this idea, Kato and Sugawara have developed an English language learning planner. Although the planner looks at first glance like an ordinary diary, it was deliberately designed this way to allow individuals to accommodate English learning in their daily lives. By using the planner, learners are able to engage in training in some of the core skills for independent learning: setting learning goals, executing learning plans, and controlling their own motivation levels. From their perspective as experienced learning advisors, Kato and Sugawara developed such a tool to support learners who do not know where to start to improve their English as well as those who cannot see progress in their learning. They also reported on the creation of an online community, in which learners can share their learning experiences to help them keep motivated and for them to learn from each other. These aspects are incorporated into the planner to emphasize that interdependence is an element of successful independent learning. Azusa Kodate, a learning advisor at Hiroshima Bunkyo Women’s University, also emphasized the importance of developing the metacognitive dimension in language learning. While the learning tool developed by Kato and Sugawara targeted learners more broadly, Kodate introduced teaching materials that she had developed for first-year undergraduate learners who take her course on independent learning. In this programme, learners are introduced to the conceptual ideas and the benefits of independent learning, some of the core skills required to conduct independent learning (e.g., needs analysis, goal setting, materials selection, and evaluation), and strategies for English language learning. Having been introduced to the theoretical aspects, learners carry out their own independent English learning projects, thereby transforming the knowledge they acquired from the course into practice. Throughout this process, learners are strongly encouraged to work on the metacognitive dimensions of learning, which, according to Kodate’s description based on O’Malley and Chamot’s (1990) research findings, includes ‘planning’, ‘monitoring’, ‘problem-solving’, ‘evaluation’, and ‘controlling emotion’ skills. To raise learners’ awareness of the importance of reflecting on these skills, a checklist was embedded in a learning evaluation booklet, in which learners were asked to keep a record of their learning. This booklet gives them an opportunity to evaluate the metacognitive dimension in their learning processes after every lesson. Kodate noted that learners seemed to exercise such skills more consciously and frequently by building the check-list into the Learning Evaluation Booklet. Because this was learners’ first experience of using a check-list, and because their levels of independence as well as English ability change constantly, Kodate mentioned the need to introduce a tool, such as a checklist, with some caution to provide effective support for learners’ independent learning. What emerged from the presentations by Kato and Sugawara, and by Kodate was the importance of understanding and control over both cognitive and psychological processes as skills to conduct independent language learning. As Benson (1997; 2011) describes autonomy as technical abilities to execute learning, the psychological capacity to control motivation, and metacognitive skills to control content and learning processes, focusing both on the linguistic and metacognitive aspects would be a key to successful independent language learning. In the JASAL forum, three main themes, “focusing on the physical learning environment”, “providing easier access to learners”, and “supporting learning processes” were identified and discussed. The presentations also brought the participant’s attention to the reality that having approachable environments and providing access to them alone do not guarantee development of independent learning skills. It is, therefore, important that we work on all three aspects to promote independent learning successfully. What also emerged from reflecting on the presentations and discussions is that now that SACs have become more established in educational institutions, it is time for us to assess to what extent we can incorporate our learners’ viewpoints, needs, and levels to provide better and more supportive education. As institutions that offer voluntary learning spaces and resources, the ultimate decision about whether or not to use a SAC depends on individual learners. However, as educators, we also have the responsibility to create opportunities for learners to be introduced to such learning environments and resources and to provide them with the necessary training to maximize the educational benefit. Azusa Kodate is a full-time learning advisor at the Self-Access Learning Centre at Hiroshima Bunkyo Women’s University. She teaches a classroom-based independent learning course. She also develops in-house learning materials for the centre. Her academic interests are in language learning advisor training, adult education, and human resources management. Benson, P. (1997). The philosophy and politics of learner autonomy. In P. Benson, & P. Voller (Eds.). Autonomy and independence in language learning (pp. 18-34). New York: Longman. Benson, P. (2011). Teaching and researching autonomy (second edition). London: Longman. Gardner, D., & Miller, L. (2005). Establishing self-access: From theory to practice. Cambridge: Cambridge University Press. Kato, S., & Sugawara, H. (Forthcoming 2012). Eigo gakushuu techo 2013. (English language learning planner 2013) Chiba: Kanda Gaigo Daigaku Shuppan Kyoku. O’Malley, M., & Chamot, U. (1990). Learning strategies in second language acquisition. New York: Cambridge University Press.